This pattern was inspired by the Greek myth of Andromeda, chained to a rock as a sacrifice for Cetus as punishment for her mother’s vanity. She was rescued by Perseus and married him. When Andromeda died, Athena placed her in the sky, near Perseus. 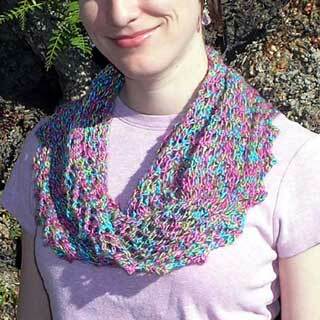 This pattern combines the chain lace pattern with the baby cable, and is topped with beads and a picot cuff. 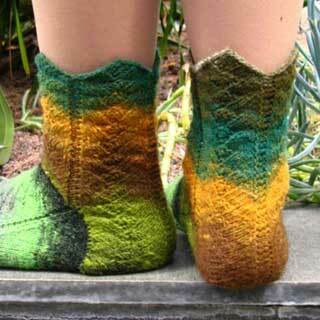 The pattern is written denoting instep, sole and gusset, so that it can be knitted using dpns, magic loop or 2 circs. RT: right twist – k2tog (don’t slip stitches off left needle), insert right needle into first sts on left needle and k, slip both sts of left needle. The beading is worked so that the beads sit vertically. The crochet hook should be small enough so that you can thread the bead though it. 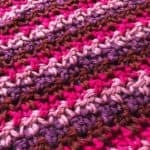 To add a bead, slip 1 bead onto the crochet hook, slip crochet hook through loop on left needle. Pull the loop through the bead’s hole, slip st back to left needle. Purl the st with the bead. CO 60 sts. Join in the rnd being careful not to twist. Next Rnd (eyelet rnd): *K2tog, yo, rep from * to end of rnd. Next Rnd: *P2, k, rep from * to end of rnd. Work lace pattern as per chart until leg is approx 6 inches from cast on row, ending with row 6 of lace pattern. Divide heel and instep sts so that there are 32 sts for the instep and 28 sts for the heel. Note: The heel flap is worked flat. Rep Rows 1 -6 until heel is desired length (approx 2.25in). Pick up and k 18 sts along side of heel flap. Work across instep cont in est patt. Pick up and k 18 sts along opposite side of heel flap and k half of the heel sts. Slip the remaining heel sts onto needle with the initial 18 gusset sts. Rep these 2 rnd until 62 sts rem. Cont without decreasing until foot measures 2.5in (6.5cm) less than desired finished length, ending with Rnd 2 of chart. Adjust end of rnd by knitting the remaining sole sts so the new end of rnd is between the end of the sole and the beginning of the instep. There are 32 instep sts and 30 sole sts. 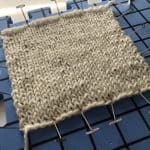 There are now 60 sts – 30 instep and 30 sole. Repeat these 2 rnds until there are 32 sts remaining (16 instep and 16 sole). Repeat Round 1 only until there are 16 sts remaining (8 instep and 8 sole). Graft toe sts and weave in ends. Fold cuff under at the eyelet row to create picot edge. Hem cast on edge to inside of sock to create picot hem. Polly knits and blogs at alltangledup.com. 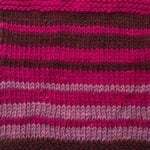 Pattern and images © 2009 Polly Outhwaite.